205 S Main Marine City, MI. | MLS# 31364784 | Marine City and Algonac homes for sale,Westrick Real Estate One 810-765-8861, Marine City MI Homes,Real Estate Marine City MI,Homes for Sale Algonac,Algonac MI Agent, Home for sale St. Clair MI,St. Clair Homes for Sale,Property Marine City, Algonac Homes. 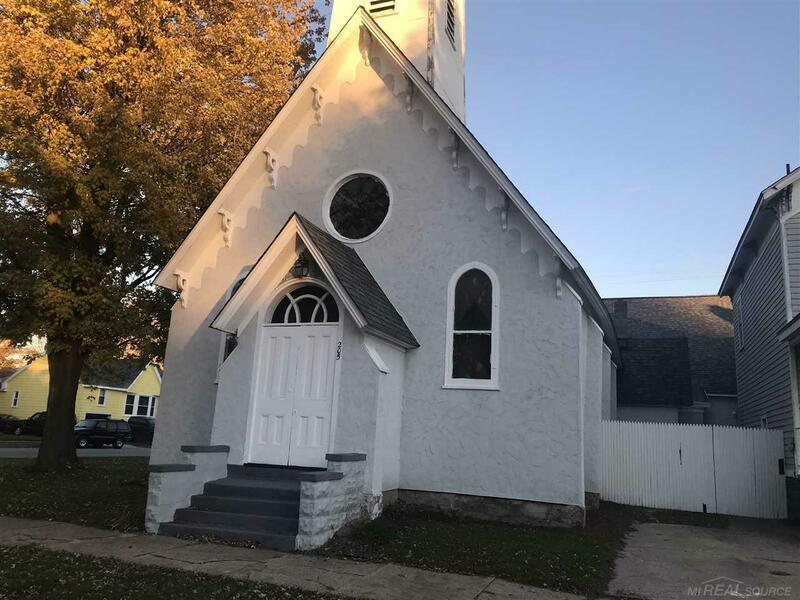 Marine City Historic Church, Nicely finished with attached residence included in sale (Sale includes 211 S Main, parcel ID 024750200100. ) MLS# 31364790 . Church Proper, Assemble Hall and Full kitchen. 2 half baths (His and Hers). Just think of all the possibilities you could use this for. 2 blocks from the St. Clair River, lots of shopping and many parks. There is also a breezeway between the house and church, a front entry way and an office area, and a classroom, walk in coat closet with a little entry way on the first floor. Upstairs is accessed by a spiral steel staircase and has 4 little rooms once used as classrooms. The Church has central air and heat and a full sized kitchen with lots of cupboards. 2 swing open windows for passing through from the kitchen to the assembly room. Accepted offer is contingent on inspection and appraisal.